I once had someone tell me that “raw food is so boring and tasteless.” They had obviously never tried the raw food delicacies from Sunfood. Sunfood has been a leading seller of organic and raw foods for over 15 years and the quality is excellent and so unique. Have you ever tried Wild Jungle Peanuts from the Amazon? If not, you really should experience these delicious peanuts. There is a distinctive raw taste that at first I wasn’t sure if I would care for since I like my peanuts roasted and salted. 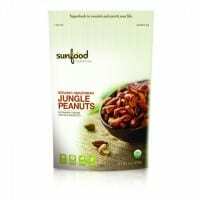 Then I realized that it had such an earthy and rich peanut flavor that I found myself having more and more until I realized “I really like these!” Sunfood Amazonian Jungle Peanuts are packed full with eight essential amino acids and are “heart healthy” with 40% oleic acid. I wish that I had a way to grind these into a peanut butter because I imagine it would be delicious. Even though my children didn’t care for these Wild Jungle Peanuts by itself at first, when I mixed up a trail mix recipe they thought it was delicious and enjoyed it as a healthy snack. If you thought that Wild Jungle Peanuts was a taste of the exotic then you simply have to try Organic Incan Berries. Considered to be “one of the lost crops of the Incas”, Organic Incan Berries have a wonderfully chewy texture and is delicious as it is both sweet and tart. I was shocked that one service has 30% of the recommended daily value of Vitamin A, 10% Vitamin C, 5 grams of dietary fiber, bioflavonoids, iron, potassium and phosphorus. Incan berries are said to “help assist the body with stress and circulation” which I find fascinating. I used these berries in the trail mix recipe and my children were gobbling it up asking for more. To learn more about all of the benefits of Organic Incan Berries you can visit their site. Sunfood has such diverse raw and organic foods including snacks, supplements, Superfoods, treats, chocolate and much more. I even noticed that they have CD/DVD’s, Appliances and books that will help you start or continue a raw food lifestyle. Even if you don’t eat only “raw” (I don’t), I still think it is important for my family to include many raw foods into our diets. Never let anyone tell you that raw food is boring again……just point them in the direction of Sunfood! Connect with Sunfood on Facebook and Twitter.